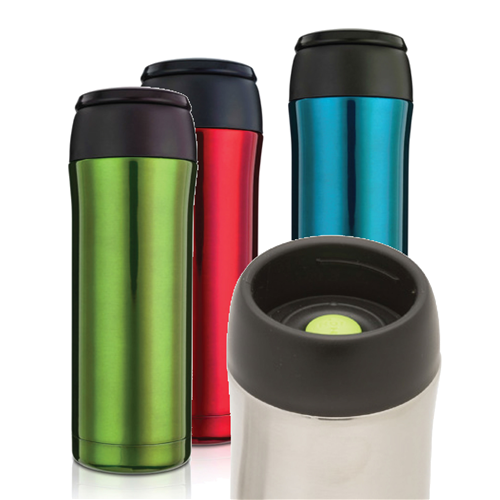 JOEmo is an elegant design from Highwave that features a stainless thermos mug which keeps coffee hot longer than any other mug and is absolutely leak and drip proof with the final top on. Comfortably holds 13 ounces. BPA free. The original and patented vacuum inspired by the the Ipod. JOEmo can be carried in your briefcase or backpack. Sip JOEmo anywhere on its drink top. No need to find the drink hole while driving. Have hot coffee in the car, boat, bike or plane. Take the empty mug through security and fill it up before your flight. Leakproof with final top like a thermos, stays hot up to 6 hours. Push the center button to drink and touch the plate around the button to shut the top.